Courting a suffragette is hard work. All Jed really wants to do is protect Esme from the more unsavory elements of the settlement, not assert his dominance over her or any such nonsense. Esme, of course, is determined to misinterpret his every move, even though if she'd admit it to herself she'd realize that she wouldn't mind being courted by Jed in the first place. That may have to wait, however. As the Hindu holiday of Diwali approaches, Esme catches wind of a terrible plot to kill the Prince of Wales. She comes across the design for a device called Kali's Scream. If the blueprints and description are to be believed, it can emit and amplify a sound wave so that it could take down a building, killing everyone inside. With time running out, it's up to Jed to create a prototype for proof of concept, and convince the police that it's a real threat. In the meantime, the owner of the blueprints has a pretty good idea who has his papers, and will do what it takes to get them back. Fans of 'Wanted: One Scoundrel' should enjoy this new foray into the early days of Australia. A country that is a wonderful mix of all the cultures the British Empire has to offer, it's wonderful to see their town celebrating Diwali rather than a more traditional Western holiday. 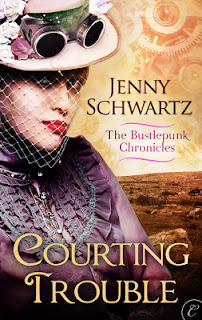 Once again, Jenny Schwartz blends romance, steampunkery and a fiercely independent young lady into a lovely story. Highs: If a strident feminist can't bear the condescension of being courted, then perhaps she should try doing the courting herself. Lows: Both Lajli and Gupta could have been fleshed out much more. Verdict: Another lovely, yet fairly innocent addition to the growing number of steampunk romance stories.